update the rc_visard’s firmware or license. In the rc_visard’s REST-API, a node is a computational component that bundles certain algorithmic functionality and offers a holistic interface (parameters, services, current status). Examples for such nodes are the stereo matching node or the visual odometry node. The general entry point to the rc_visard’s API is http://<rcvisard>/api/, where <rcvisard> is either the device’s IP address or its host name as known by the respective DHCP server, as explained in network configuration. Accessing this entry point with a web browser lets the user explore and test the full API during run-time using the Swagger UI . PUT Modify a resource and return the modified resource as JSON. POST Upload file (e.g., license or firmware image). Depending on the type and the specific request itself, arguments to HTTP requests can be transmitted as part of the path (URI) to the resource, as query string, as form data, or in the body of the request. The following examples use the command line tool curl, which is available for various operating systems. See https://curl.haxx.se. 200 OK The request was successful; the resource is returned as JSON. 400 Bad Request A required attribute or argument of the API request is missing or invalid. 404 Not Found A resource could not be accessed; e.g., an ID for a resource could not be found. 403 Forbidden Access is (temporarily) forbidden; e.g., some parameters are locked while a GigE Vision application is connected. 429 Too many requests Rate limited due to excessive request frequency. The actual behavior, allowed requests, and specific return codes depend heavily on the specific resource, context, and action. Please refer to the rc_visard’s available resources and to each software component’s parameters and services. /nodes: Access the rc_visard’s software components with their run-time status, parameters, and offered services. /datastreams: Access and manage data streams of the rc_visard’s The rc_dynamics interface . /logs: Access the log files on the rc_visard. /system: Access the system state and manage licenses as well as firmware updates. The returned status values are specific to individual nodes and are documented in the respective software component . The status values are only reported when the respective node is in the running state. Most nodes expose parameters via the rc_visard’s REST-API to allow their run-time behaviors to be changed according to application context or requirements. The REST-API permits to read and write a parameter’s value, but also provides further information such as minimum, maximum, and default values. Run-time parameters are specific to individual nodes and are documented in the respective software component . Most of the parameters that nodes offer via the REST-API can be explored and tested via the rc_visard’s user-friendly Web GUI . Some parameters exposed via the rc_visard’s REST-API are also available from the GigE Vision 2.0/GenICam image interface . 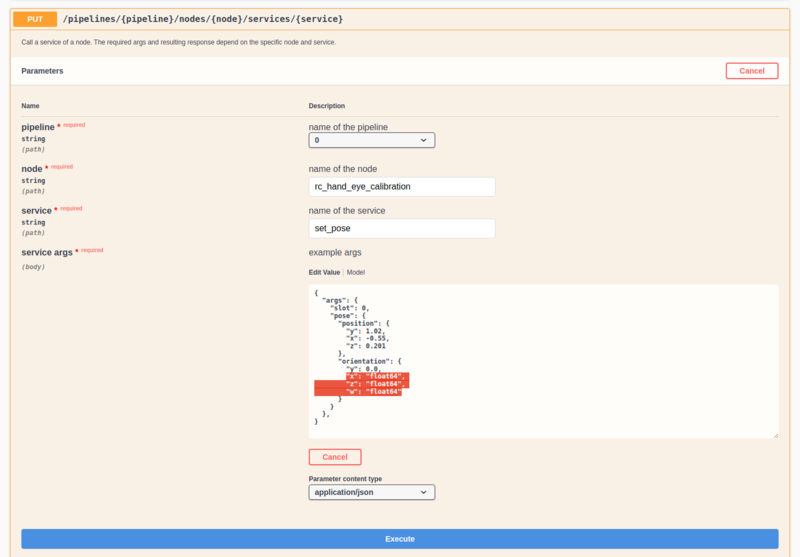 Please note that setting those parameters via the REST-API is prohibited if a GenICam client is connected. In addition, each node that offers run-time parameters also features services to save, i.e., persist, the current parameter setting, or to restore the default values for all of its parameters. The services and corresponding argument data models are specific to individual nodes and are documented in the respective software component . Get list of all available nodes. Get info on a single node. Get parameters of a node. 403 Forbidden – Parameter update forbidden, e.g. because they are locked by a running GigE Vision application or there is no valid license for this component. Get a specific parameter of a node. Update a specific parameter of a node. Get descriptions of all services a node offers. Get description of a node’s specific service. Call a service of a node. The required args and resulting response depend on the specific node and service. 403 Forbidden – Service call forbidden, e.g. because there is no valid license for this component. Get status of a node. Get list of available data streams. Delete a destination from the datastream configuration. the rc_visard to be updated with a new firmware image. Get list of available log files. Get a log file. Content type of response depends on parameter ‘format’. Get system information on sensor. Get information about licenses installed on sensor. Update license on sensor with a license file. Get information about currently active and inactive firmware/system images on sensor. Rollback to previous firmware version (inactive system image). Update firmware/system image with a mender artifact. Reboot is required afterwards in order to activate updated firmware version. The REST-API defines the following data models, which are used to access or modify the available resources either as required attributes/parameters of the requests or as return types. Information about currently active and inactive firmware images, and what image is/will be booted. Information about specific firmware image. ImageInfo objects are nested in FirmwareInfo. List of the licensing status of the individual software components. The respective flag is true if the component is unlocked with the currently applied software license. LicenseComponents objects are nested in LicenseInfo. Information about the currently applied software license on the sensor. Content of a specific log file represented in JSON format. Representation of a single log entry in a log file. LogEntry objects are nested in Log. Information about a specific log file. Description of a computational node running on sensor. Detailed current status of the node including run-time statistics. Status of the NTP time sync. NtpStatus objects are nested in SysInfo. Representation of a node’s run-time parameter. The parameter’s ‘value’ type (and hence the types of the ‘min’, ‘max’ and ‘default’ fields) can be inferred from the ‘type’ field and might be one of the built-in primitive data types. Status of the IEEE1588 (PTP) time sync. PtpStatus objects are nested in SysInfo. Representation of a service that a node offers. 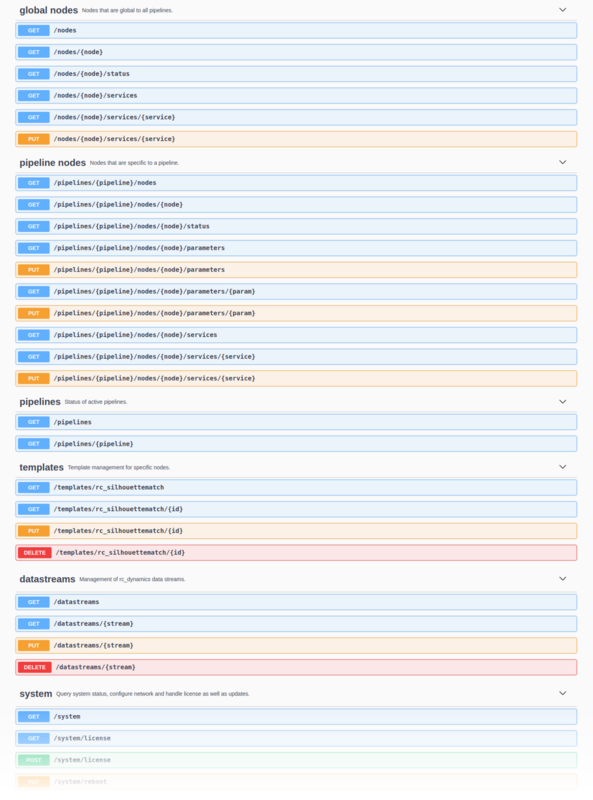 Arguments required to call a service with. The general representation of these arguments is a (nested) dictionary. The specific content of this dictionary depends on the respective node and service call. ServiceArgs objects are nested in Service. The response returned by the service call. The general representation of this response is a (nested) dictionary. The specific content of this dictionary depends on the respective node and service call. ServiceResponse objects are nested in Service. Represention of a data stream offered by the rc_dynamics interface. An object of type StreamDestination is of primitive type string. StreamDestination objects are nested in Stream. Description of a data stream’s protocol. StreamType objects are nested in Stream. System information about the sensor. 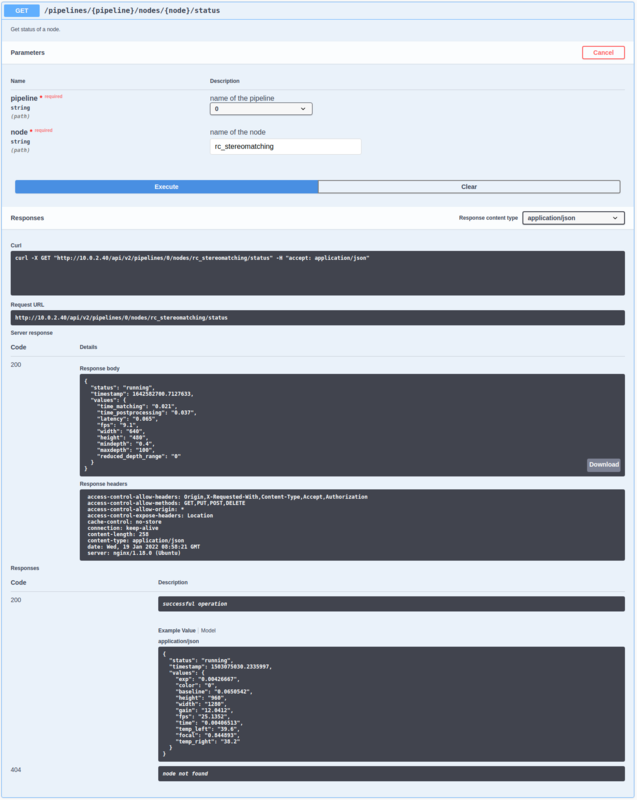 The rc_visard’s Swagger UI allows developers to easily visualize and interact with the REST-API, e.g., for development and testing. Accessing http://<rcvisard>/api/ or http://<rcvisard>/api/swagger (the former will automatically be redirected to the latter) opens a visualization of the rc_visard’s general API structure including all available resources and requests and offers a simple user interface for exploring all of its features. Users must be aware that, although the rc_visard’s Swagger UI is designed to explore and test the REST-API, it is a fully functional interface. That is, any issued requests are actually processed and particularly PUT, POST, and DELETE requests might change the overall status and/or behavior of the device. Using this interface, available resources and requests can be explored by clicking on them to uncollapse or recollapse them. The following figure shows an example of how to get a node’s current status by filling in the necessary parameter (node name) and clicking the Try it out! button. 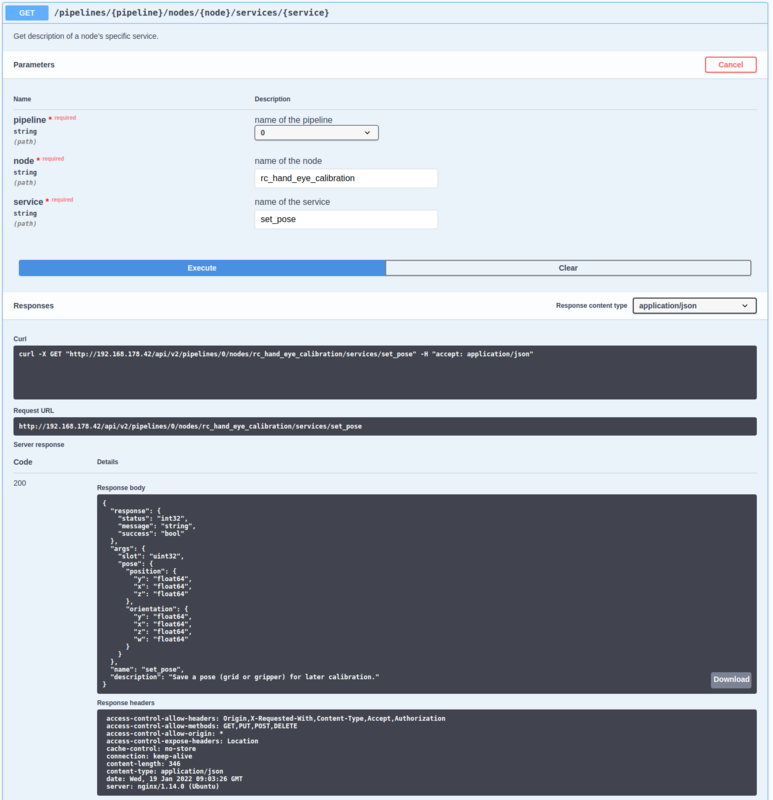 This action results in the Swagger UI showing, amongst others, the actual curl command that was executed when issuing the request as well as the response body showing the current status of the requested node in a JSON-formatted string. Some actions, such as setting parameters or calling services, require more complex parameters to an HTTP request. The Swagger UI allows developers to explore the attributes required for these actions during run-time, as shown in the next example. In the figure below, the attributes required for the the rc_hand_eye_calibration node’s set_pose service are explored by performing a GET request on this resource. The response features a full description of the service offered, including all required arguments with their names and types as a JSON-formatted string. Fig. 55 The result of the GET request on the set_pose service shows the required arguments for this service call.